Is this that spambot I keep getting telling me how much he hates Superman? While Superman is on Mars Clark Kent is pulling a rather spectacular bank robbery. Since he can’t give his actual alibi Clark is thrown in prison while Lois promises to find out who framed him. It turns out to be Multi-Face, seeking revenge for his botched assassination of Superman when the assassin posed as Clark. 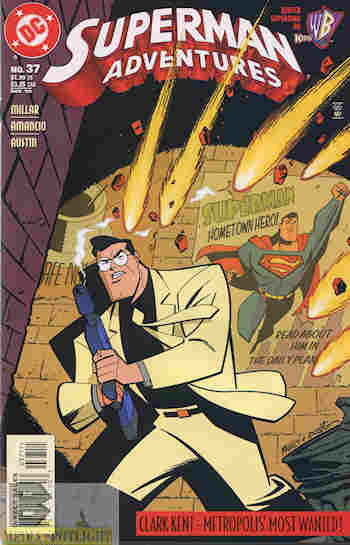 He captures Lois and Jimmy, and Clark has to be clever to get out of prison and rescue them, clearing his name. As for Multi-Face…Clark made some friends in the slammer, and they’re so very happy to meet the man that framed him. What they got right: I certainly like the idea of the story. How can Clark clear his name and do what Superman needs to do when he’s in jail? The whole story is good and it shows that Superman is also rather smart, with how he gets to help his friends and save himself from Multi-Face’s trap. What they got wrong: The art isn’t as good. Unlike the cover, the art is often exaggerated. Facial expressions don’t look right sometimes, and while Bruce Timm’s design of Superman already has too long a chin in here Clark looks like the Crimson Chin from Fairly Oddparents in a couple of panels. Recommendation: A good story worth reading. Posted by ShadowWing Tronix on September 29, 2018 in Animation Spotlight, DC Spotlight, Television Spotlight, Yesterday's Comics and tagged Clark Kent, DC animated universe, DC Comics, DCAU, Multi-Face, Superman.